As part of an official visit to the Holy See, T.S.H. 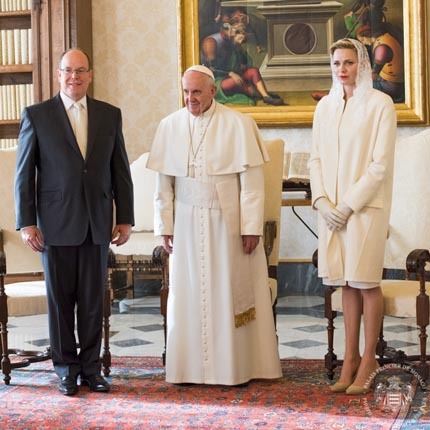 Prince Albert II of Monaco and Princess Charlene were received in audience by His Holiness, Pope Francis. This meeting enabled Them to discuss a range of issues with the Pontiff, directly related to the encyclical "Laudato Si", including the protection of the environment and the prospects opened up by COP 21, the situation in the Mediterranean, climate migrations, education, the meeting in Monaco from 6 to 9 October of the Council of European Bishops' Conferences, and finally the Sport and Faith Conference to be held in the Vatican on 5 October 2016. Prince Albert and Princess Charlene presented Pope Francis with an ancient coin dating from 1720 which honours the memory of Saint Dévote, the patron saint and protector of the Royal Family and the Principality. They also brought a basket of vegetables, fruits and cheeses from the Rocagel Estate. The Royal Couple was then received by Cardinal Pietro Parolin, Secretary of State, accompanied by Archbishop Paul Richard Gallagher, Secretary for Relations with States and Monsignor Joseph Murphy. This meeting was used to explore these various issues in detail. Finally, the Prince and Princess visited the Clementine Chapel for private prayers. The Royal Couple was accompanied by H.E. Claude Giordan, Monaco's Ambassador to the Holy See and Mr Georges Lisimachio, Head of Cabinet of H.S.H. the Sovereign Prince, Lt. Col. Lawrence Soler, Chamberlain and Lt. Col. Michael Benichou, Aide-de-Camp.